Dr. Lohan is a Diagnostic Cardiovascular Imaging Fellow, Dr. Saleh is a Research Fellow, Dr. Tomasian is a Research Fellow, Dr. Krishnam is an Assistant Professor of Radiology, and Dr. Finn is a Professor of Radiology and Medicine, Chief of Diagnostic Cardiovascular Imaging, and Director of Magnetic Resonance Research, Department of Radiology, David Geffen School of Medicine at University of California, Los Angeles, CA. A complementary approach to imaging a contrast bolus involves multiple measurements repeated rapidly to document the first pass of the bolus through the various compartments of the circulation. This has become known as time-resolved MRA (TR-MRA), and it can be used to provide dynamic or functional information that is not available from a conventional single-phase MRA. A number of practical implementations of TR-MRA have been described, each with its advantages, drawbacks, and system requirements. In this article, we will describe our experience with one class of TR-MRA and emphasize that other approaches are also possible. Time-resolved MRA allows confident separation of arterial and venous phases of vascular enhancement and provides intuitive information regarding directional and temporal parenchymal perfusion. Quantitative surrogates of organ perfusion in the form of time-to-peak (TTP) signal intensity, maximal upslope of the curve (MUS), maximal signal intensity (MSI), and mean transit time (MTT) can be readily derived from dynamic angiographic data. 8 Considering the heightened awareness of potential side effects of the use of contrast media in patients with renal failure, the potential contrast dose reduction using TR-MRA is particularly beneficial. Many of the current regimens use contrast doses as low as 0.05 mmol/kg. 8 This article considers the underlying principles of TR-MRA, exploring several current applications of this technique in clinical practice. Dynamic, first-pass imaging of a contrast bolus has been extensively studied; it was initially performed with a 2-dimensional (2D) projectional technique, 9 sometimes with repeated injection of small contrast doses. 10 More recently, 3D TR-MRA has been described for a number of clinical applications. 8,11-13 Two broad approaches to 3D TR-MRA have been pursued; the first approach generates speed by compromising on through-plane resolution, 14 and the other generates speed by compromising on temporal resolution of high spatial frequency components. 15 A third approach, still under development, is to use a 3D, spherical k-space acquisition with extensive temporal sharing of high spatial frequency components. 16 In this article, we will address variants of the first category. Parallel imaging makes use of the spatially dependent sensitivities of individual elements in a receiver coil array to substitute for some of the spatial encoding previously performed only by the gradients. 18,19 The spatial sensitivity of each distinct coil element provides signal that is unique to its location within the FOV. In so doing, this approach substitutes for some phase-encoding steps, with coil sensitivity profiles providing the remaining data. Time-resolved MRA has been successfully applied to a variety of anatomic regions, with very positive results. In our practice, we generally use TR-MRA prior to performing high spatial resolution MRA, in order to provide additional functional information. For TR-MRA, we use only a very small dose of contrast (2 to 4 mL), so that there is little incremental cost, time, or risk to the patient. Caroticovertebral and intracranial MRA is challenging and very important. The feasibility of intracranial TR-MRA was initially demonstrated by Wang et al, 27 using a 2D technique in 28 patients with a temporal resolution of 2.2 seconds. 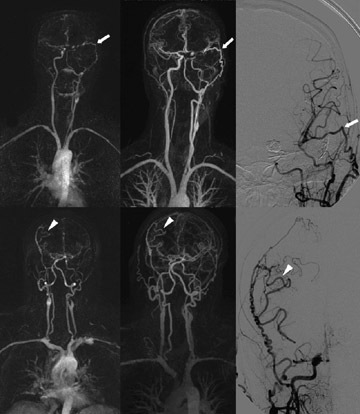 Klisch 10 used a similar technique in 4 patients with cerebral arteriovenous malformations and dural arteriovenous fistulae, before and after intravascular embolization, concluding that temporal evaluation provided invaluable data with regard to the hemodynamics of such shunting. Lenhart 28 evaluated the diagnostic accuracy of 3D carotid arterial TR- MRA at 1.5T, compared with the gold standard of selective catheter angiography. These authors performed 4 consecutive measurements, each with a duration of 10 seconds, isolated the arterial phase in all 43 patients, and reported a sensitivity and specificity for the detection of >70% stenoses of 98% and 86%, respectively. By today's standards, a temporal resolution of 10 seconds is modest. Further advances in gradient coils, multielement detector arrays, parallel imaging, and sequence design facilitated the application of TR-MRA to the assessment of extracranial-to-intracranial bypass grafts 29 as well as to various craniocervical vascular disorders, 30 with temporal resolution approximating 1 second per frame (Figure 1). The improved temporal resolution also facilitated the evaluation of regional flow dynamics, including signal-intensity-over-time curves and TTP enhancement, parameters of value in the differentiation of cervical glomus tumors from hypovascularized malignant tumors, as reported by Michaely et al. 31 More recently, the availability of 3T systems has further advanced the versatility of TR-MRA, facilitating increased spatial resolution over large FOVs at ever-decreasing contrast doses. 20 The full potential of 3T head and neck TR-MRA is yet to be realized. Finn et al 14 performed pulmonary arterial dynamic imaging with acquisition times of 800 msec using gadolinium contrast doses as small as 6 mL. Fink et al 32 later confirmed the improvements in image quality in their observer preference study comparing echo-shared parallel TR-MRA of the lung with non-echo-shared sequences, determining the former to achieve higher spatial resolution, which was ultimately perceived as improved image quality. More recently, TR-MRA has been applied to acutely ill patients with suspected pulmonary embolism. Ersoy et al 33 confirmed that consistent arterial-phase imaging, which is capable of allowing confident diagnosis from the main pulmonary artery through the segmental branches, has potential value as a screening examination in patients with contraindications to the use of iodinated contrast material. The technical feasibility of pulmonary TR-MRA has also been shown at 3T, with comparable perfusion and flow indices at this field strength as at 1.5T. 11 Nael et al 34 reported confident visualization up to the fourth-order pulmonary arterial branches using TR-MRA, compared with fifth-order branches using high-resolution CE-MRA, thus providing high vascular morphologic detail and dynamic functional information, of particular utility in patients with pulmonary arterial hypertension. As discussed above, TR-MRA allows clear separation of arterial and venous phases of enhancement during a single contrast bolus injection. Körperich et al 35 confirmed the utility of this technique in the evaluation of pulmonary venous return after radiofrequency pulmonary vein isolation for atrial fibrillation. 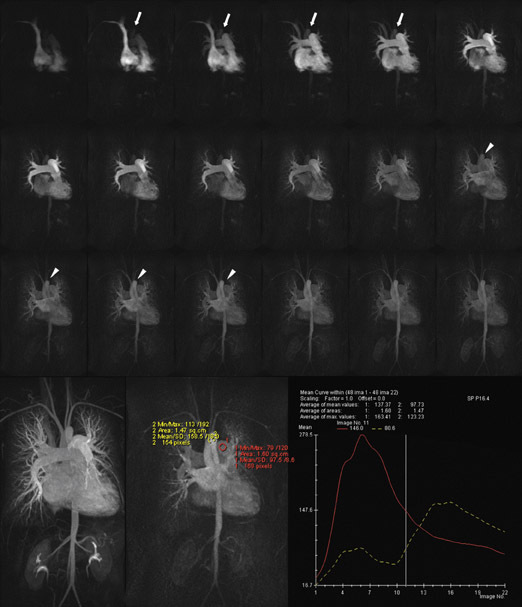 One of the technical challenges associated with peripheral MR angiography is the synchronization of data acquisition with the arrival of the contrast bolus within the vessels of interest such that the center of k-space corresponds with peak vascular luminal enhancement. This is of particular importance with regard to the trifurcation vessels, in which premature image acquisition results in suboptimal vascular enhancement, and late acquisition results in venous contamination. This may be further compounded by the presence of differential vascular filling between the 2 limbs or within a single extremity, due to the presence of proximal significant stenosis (Figure 3). While most often used as a means of reliable prevention of venous contamination during the arterial phase of peripheral imaging, the potential role of TR-MRA in the evaluation of the lower extremity venous system has also been assessed. 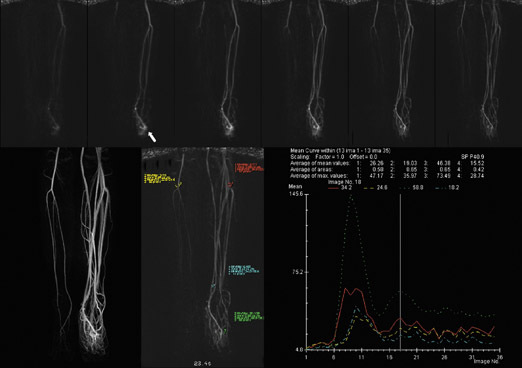 Successful dynamic isolated venous-phase lower extremity imaging has been reported by Du et al 44 using an automated segmentation algorithm based on a contrast arrival time threshold, confirming the potential for both arterial and venous-phase peripheral vascular imaging using a single-injection technique. Even allowing for the multiplanar imaging capabilities of MRI, detailed assessment of congenital heart disease-in particular the integrity of postoperative shunts and conduits-remains a considerable challenge for modern imaging techniques. While CT angiography and MRA are often adequate for confirmation of chamber patency, the detection of directional flow and of subtle pulmonary-systemic shunts often remains beyond the capabilities of "static" imaging techniques. The potential utility of TR-MRA has been recognized with regard to assessing these parameters in the presence of congenital heart disease (Figure 4), with encouraging results in the evaluation of Fontan circulation or bidirectional cavopulmonary connections where the details regarding flow dynamics and the morphology of the pulmonary circulation, including lung perfusion status, were reliably assessed (Figure 5). 45 The versatility of this technique was further assessed in the study of Mohrs et al 46 during which single-breath-hold dynamic imaging was performed in 20 adult patients with a variety of congenital anomalies of the great vessels, cardiac chambers, and pulmonary-systemic communications. Despite the diversity of types of pathology encountered, TR-MRA performed very well in this regard, providing vital anatomic and qualitative functional information. Early attempts at applying MRA to the evaluation of upper extremity hemodialysis shunts were limited by restrictions in the FOV attainable prior to the advent of parallel imaging techniques. This was further compounded by the presence of rapid arteriovenous transit time, relative to the poor temporal resolution of "static" high-resolution CE-MRA. The subsequent realization of large-FOV high-resolution TR-MRA has obviated the need for the previously attempted technique of multistation shunt assessment. Zhang et al 47 applied 3D TR-MRA using parallel imaging to the assessment of 9 malfunctioning upper extremity AV accesses at 1.5T; this technique provided single-station entire inflow-outflow morphologic and functional evaluation, using a single-contrast injection. A high level of intermodality agreement was found when this technique was compared with conventional DSA. These sentiments were later echoed in the studies of Pinto 48 and Mende. 49 At present, concerns regarding the administration of gadolinium-based contrast media in patients with severe renal impairment abound in the literature, thus making the role of this technique in the evaluation of these patients uncertain. However, the opportunity for reduced contrast doses at higherfield strengths and the versatility of this technique make it a problem-solving tool of considerable potential. The considerable attributes of TR-MRA have been recognized and embraced over a number of years. It is set to play a central role in routine clinical vascular assessment. 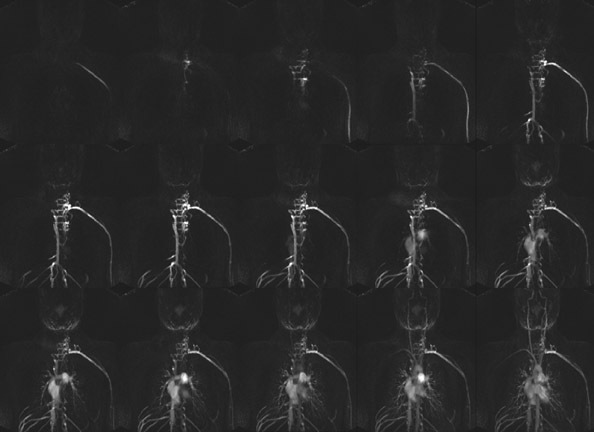 While the versatility of TR-MRA continues to expand (Figure 6), advances in MR technology have positioned it as one of the imaging techniques of the future, allowing single-injection, large-FOV, functional vascular assessment with minimal contrast doses. Utility of Time-Resolved MR Angiography in Clinical Practice. Appl Radiol.